Sri Nathamuni, widely regarded as the first among the Srivaisava Acarya-s, lived in the ninth century AD, and is best known for his revival of the Drevide-vede-s, also known as the Nalayira-divya-prabandham. This revival formed a firm base on which later Acarya-s would establish the Sri Vaisnava-sampradaya and the Visistadvaita tradition. These Acarya-s included his own grandson Sri Yamunacarya and Bhagavad Ramanujacarya, who stoked the spark of light lit by Nathamuni into a radiant and strong tradition. Nathamuni was also a master exponent of other Vedic philosophies including Nyaya and Yoga, on which he composed the texts Nyayatattva and Yogarahasya respectively. Literally meaning 'The Secrets of Yoga.' the Yogarahasya is a masterpiece offering deep insights into the use and applications of Yoga, especially in the domains of Yoga therapy and spirituality. It also reveals Nathamuni as a remarkable Yogi, who revolutionized many customs prevailing at his time. A prime example of this was his advocacy of Yoga for women, which was not at all common in the ninth century. The Yogarahasya was meant to be taught to Sri Yamunacarya by Nathamuni's student Kurukaikavalappan. For unknown reasons this meeting did not take place and the text was lost for many centuries. 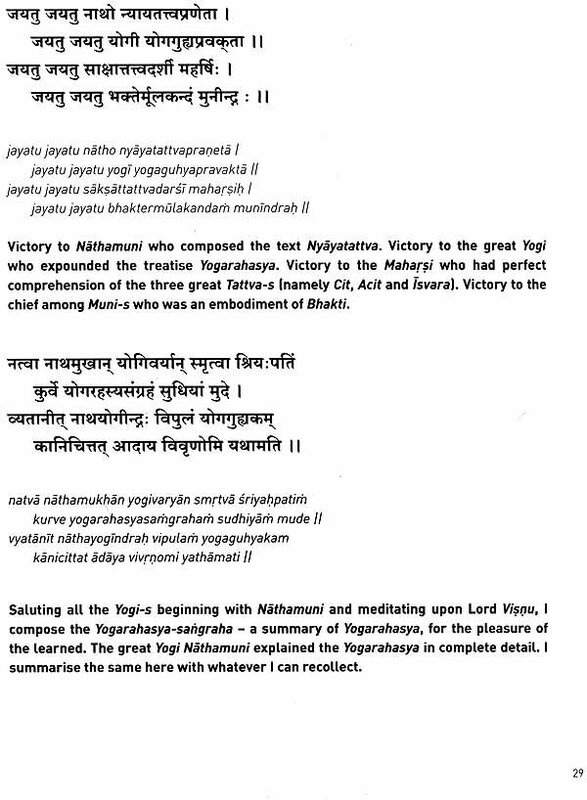 However, by divine grace, one of Nathamuni’s direct descendants, Yogacarya T Krishnamacharya, revived this text through a powerful experience he had as a young man under a tamarind tree in Alvar-tirunagari. This same tamarind tree was the place where Sri Nathamuni had earlier revived the Nalayira-divya-prabandham. 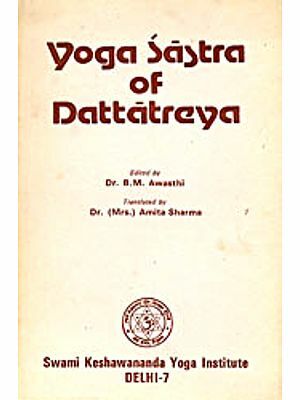 The revival of this text brings to life the great Yoga teachings of Sri Nathamuni, and provides us with invaluable information on how to use the different tools of Yoga to deal with different situations, This text formed an important reference for T Krishnamacharya's teachings, and has been a platform for the development of the tradition now known around the world as Viniyoga. 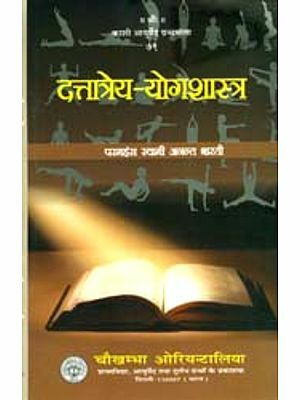 This English translation by TKV Desikachar, with the assistance of Dr. Kausthub Desikachar and Dr. Sreeram Jaganathan, provides the original text in Devanagari and Roman transliteration form, its translation into English, word-to-word meanings, and additional academic commentary by Dr. Kausthub Desikachar to help understand the deeper meanings of the text. THE YOGARAHAYSA OF NATHAMUNI will be an invaluable asset to every modern Yoga practitioner, be it student, teacher or researcher, and an excellent addition to the library of all literary scholars. Dr. Kausthub Desikachar is the successor and current lineage holder of the classical Viniyoga® tradition of T Krishnamacharya & TKV Desikachar. He is an acclaimed Yoga Teacher, Yoga Therapist, healer and spiritual adviser. His objectives include the sharing of the authentic teachings of Yoga in the modern era, as well as building bridges between different healing modalities to promote physical, emotional social and spiritual health. For over two decades, Kausthub has been teaching a multitude of students and teachers around the globe and has conducted numerous teacher and therapist training programs. He began studying Yoga when he was nine years old under the guidance of his teacher and father TKV Desikachar and started teaching at the age of thirteen. After completing his dual Master’s degree from the renowned Birla Institute of Technology & Sciences, Pilani, he committed himself to becoming a full-time student and teacher of Yoga. In 2011 he concluded his doctoral studies from the Psychology Department at the University of Madras, where firs topic of research was “Effect of lndividualised Yoga Training on Quality of Life.' He has also recently completed his M.D in Alternate Medicine. Dr. Kausthub Desikachar also works as a Yoga Therapist and offers clients astute and effective solutions for all sorts of physical, mental, emotional and spiritual illnesses. He combines his classical training in Yoga and Ayurveda, his modern education of psychology, and his Interactions with traditional healers worldwide, to offer optimum and effective synergetic solutions to alleviate a wide range of problems. As a Yoga Educator, Dr. Kausthub Desikachar is known for his remarkable, deep and well versed knowledge and his ability to present the ancient teachings in a way that is profound as well as applicable for modern day practitioners. He treats each student with respect, compassion and dignity, and honours their capacity for growth and transformation. His teachings are especially beneficial for Yega Teachers and Yoga Therapists as he helps them grasp the fullness and deep insights of the ancient teachings so that they are able to apply them in a competent and sincere way. He has also authored and co-authored numerous books on Yoga, such as "The Heart of Asana: A Comprehensive Manual On Classical Yoga Postures.' a biography of his grandfather, the great Yogacarya T Krishnamacharya, called "The Yoga of the Yogi" and "Hathayogapradipika Jyotsnayuta," a translation and commentary of this very classical Hathayoga text. Kausthub is co-founder of the Krishnamacharya Healing and Yoga Foundation (KHYF) and for a long time was a senior Yoga Therapy Consultant at the Krishnamacharya Yoga Mandiram (KYM). He has been a patron of the British Wheel of Yoga, and an advisor to the International Association of Yoga Therapists. He is currently an advisor to the Korean Yoga Alliance, and a member of the American Psychological Association, International Positive Psychology Association and the Institute of Noetic Sciences. Apart from Yoga Teaching, Dr. Kausthub Desikachar is also an avid photographer, inspirational writer and poet. He is the co-founder of "Synergies in Healing", an online journal that focuses on bridging ancient wisdom and modern day science. He not only maintains his professional practice in India, but also travels extensively to teach and train people as yoga teachers and yoga therapists around the world. For more information on his teaching schedule or to be part of his training programs, please connect through the following channels. Ever since man set foot on earth, he has experienced a life of pleasure mixed with pain. Sufferings have increased from time to time. Preventive measures have been taken to get rid of this worldly misery but they have not borne any appreciable result. In fact eradication of misery has been next to impossible. There have been enlightened men called Rsi-s who discovered that the mistaken identities between the sentient soul and the non-sentient material world become the cause of these miseries. They taught this to people who came to them and also guided them in the means to get rid of their painful experiences. These Rsi-s lived in India at different periods of time and in different places. What they preached took the shape of systems of thought called Darsana-s which became classified into Astika and Nastika. 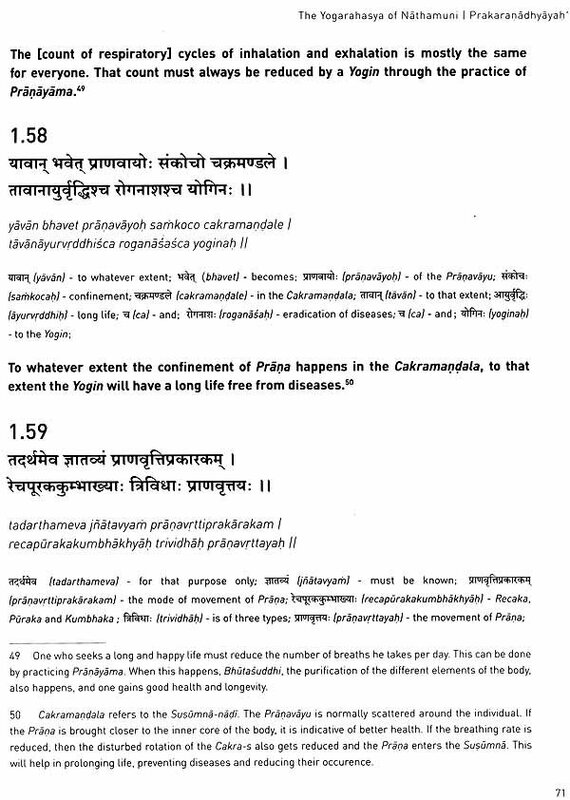 Astika admits that the Veda-s are the valid means of knowledge and Nastika denies it. To the former group belong the systems of Samkhya, Yoga and Vedanta which are of paramount importance. The Samkhya system prescribed that knowledge of the spirit and matter and the difference between them are the means of getting relief from worldly ills. Mere knowledge however could not lead to the final destruction of human misery. For, even when knowledge dawns upon man, he is not likely to detach himself from material affiliations. The mind is very hard to control as it is ever unsteady. Control over the working of the mind is necessary to make it concentrate upon an object of reality. This is what the system of Yoga preaches. It is action (Kriya) that matters most, after acquiring knowledge of reality. The word Yoga is derived from the [verbal] root yuj which means to join, unite and concentrate. The methods of controlling mental activities are given in great detail in the Mahabharata, Visnupurana (VI.7) and Bhagavata-purana in Skandha XI. The Sutra-s of Patanjali form a classical text on Yoga explaining the methods of practice and the results that may be attained. 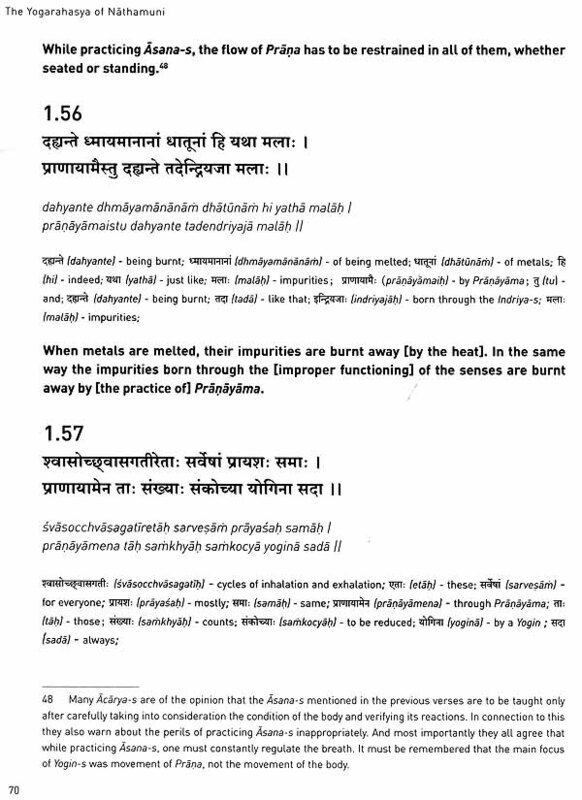 In his commentary on Patanjali’s Yogasutra, Bhoja writes in his introduction (Sloka 31 that the system of Yoga is devoted to the separation of the self from matter. Though it involves separation or disjunction [viyogal the system is called Yoga. In this sense, the spirit is in complete isolation" This interpretation could be considered correct according to the concept of Moksa in the system of Yoge. The Vedanta takes experience of Brahman as the goal. 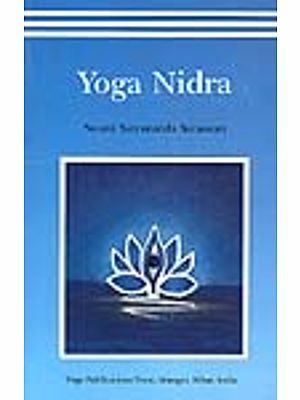 Yogi Krishnamacharya justly brought this out in the Yogavalli, his commentary on the Yogasutra, that the word nirodha in the Yogasutra (1.51) must mean free from obstruction. In other words, the experience of Brahman results, unobstructed by any factor. In the light of this observation, the word Yoga must be taken to mean the contact between the Self and the Brahman. The purpose of Yogic practice is not confined to the Self’s isolated stand, unaffected by matter. After bringing the mind under control, the Self could find the path of approaching God to serve a better purpose, like experiencing the ineffable charm of God and finding extreme delight in rendering service unto Him. Nammalvar’s meditation for sixteen years, Nathamuni's meditation on Nammalvar and vedantadesika’s meditation on Lord Hayagriva serve to illustrate this as the purpose which goaded them to discover the real nature of this concept. The concept of the state of the Self in the released stage is one of isolation (Kaivalya) from matter. This is said to be Nirbija-samadhi. This concept is admitted in the Vaisnava school. When taking nirodha in the sense mentioned above, the aspirant has enough concentration in the savikalpa stage where he is in touch with the true nature of reality, His mental functions cannot be operated except with the object of meditation (dhyeya), that is God. This is best illustrated in the case of Nammalvar. This Alvar is called Sathajit, the subduer of the Vayu called Sathe, which makes the child forget the past as soon as it is born. At the time of his birth he had reached the stage of Savikalpasamadhi. This kind of Samadhi was experienced by Nathamuni who did the Japa of Madhurakavi's 'Kenninun Siruttsmbu' and had the vision of Nammalvar. His grandson, Yamuna refers to him as the best among those who had self-control. Vedantadesika observes that Yamuna described Nathamuni as being devoted only to Visnu in his thoughts, words and acts. He further says that Nathamuni used to be absorbed in profound meditation. He is known to have had the direct vision of the three Tattva-s - cit, acit and lsvere, through his power of Yoga (svayoga-mahima-pratyakita-tattvatraya). Nathamuni wrote two works called Nyayatattva and Yogarahasya. The former is lost and the latter has been restored and published. The former must have been an extensive work on Nyaya, Mimamsa and Vedanta. 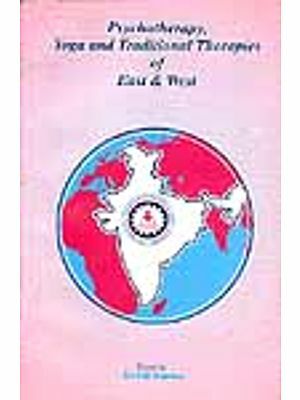 The quotations and citations which are available in the works of Yamuna and Vedantadesika6 throw light on its contents. The extensive nature of this work is revealed by the titles of the sections mentioned by Vedantadesika such as Karanapade (eighth adhikarana), Prameyapada (seventh adhikarar), Bharantyadhikarar, etc. Nathamuni had two nephews through his sisters. Their names are Vardacarya and Krsnamacarya. They lived in houses situated to the western and eastern side of Nathamuni's residence. Hence they were known as Melaiakattu-azhvan and Kizhaiakattu-azhvan respectively. They wrote Sridharayoga-kalpataru and Sridharayogapaddhati respectively on Yoga, particularly with reference to the meditations upon Sridhare [another name for Lord Narayana]. 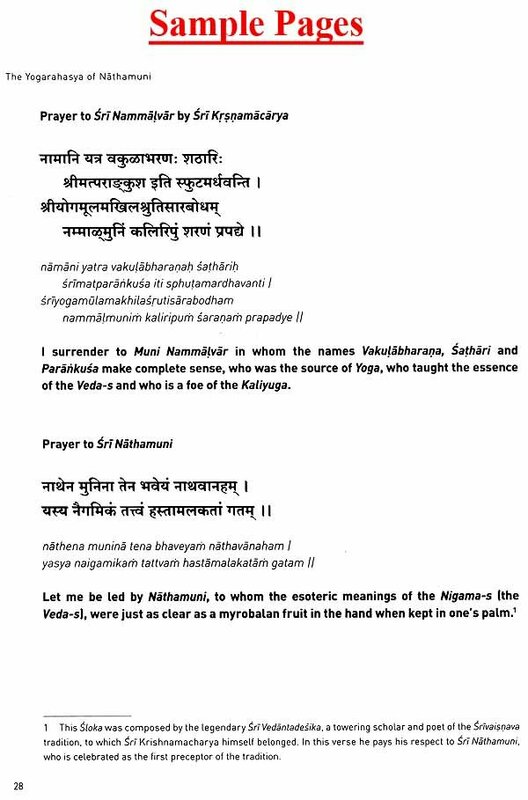 Nirmaladasa (son of Krsnamacarya) wrote a vrtti (an explanation) on Nathamuni’s Yogarahasya. Jnanavarahacarya was the son of Nirmaladasa. He wrote on the rapprochement between Patanjali's Yoga system and Nathamuni’s Yogarahasya. The name of this work remains unknown. Kurukesa, also known as Kurukaikavalappan, was the son of Jnanavarahacarya and a regular practitioner of Yoga. He was one of the disciples of Nathamuni. It is said that Yamuna, Nathamuni's second descendant in succession, was born when the latter was alive. Kurukesa, the fourth descendant in succession of Nathamuni is stated to be one of the direct disciples of Nathamuni. It is doubtful whether Kurukesa lived during the lifetime of Nathamuni. Admitting Kurukesa was the direct disciple of Nathamuni, it must be said that the genealogical version is faulty in mentioning the descendants of Nathamuni through his sisters. A reference is made to an account of the Yogarahasya and its continuity is found in the Yogavalli on the Yogasutra-s of Patanjali, Pada-I. It is mentioned here that the Yogavallari, a work on Yoga, was written by Ranganatha, who was Nathamuni's daughter's son (Maudgalyagotra). 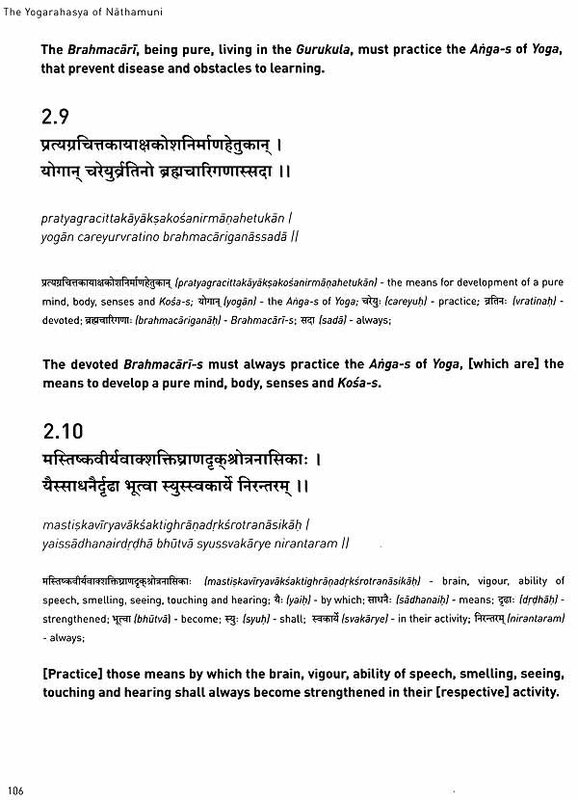 This work is a summary of Nathamuni's Yogarahasya which was divided into four Kanda-s. Yogi Krishnamacharya states here that he further condensed the Yogavallari. It is not known whether the Yogavallari is available at present. The text of Yogarahasya that is published now has four chapters. They have 117, 64, 42 and 44 slokas respectively. The titles of the four chapter mean introduction [Prakarana], [appropriate] application [Viniyogal), reflection (Vimarsanal) and parts and the whole of human (Kala) respectively. The first Stoke is in honour of the Alvar. Prakarandhyaya, introductory in nature as its name indicates, has the second Sloka in which Nammalvar receives benediction. The Alvar is an ornament of the family of those who belong to the Sathamarsana-gotra. He is the best among them who has self-control, was skilled in the subject of the eight-limbed Yoga and is a kind-hearted friend of the Lord of Sri that is Narayana.